StormVade Ads is another product of Super Web LLC that has been detected on numerous computers. It is not very likely that people can download it themselves because the download is not active on its official website. This program has been created for advertizing purposes only and it is not likely that it is going to do anything useful for your system. Thus, do not believe its promises because it will definitely not enhance your browsing experience. Besides, its compatibility with all the most popular browsers, including Internet Explorer, Google Chrome, and Mozilla Firefox, let us make an assumption that deletion is the only way to get rid of StormVade ads. This advertising-supported application acts very similarly as Trontizer, Trolatunt, MossNet and other applications; thus, if you have ever encountered the aforementioned applications, you should know that StormVade Ads are very intrusive and you might notice several of them on the page. We do not recommend clicking on them in any way because you might be redirected to the websites that contain malicious components. StormVade application is definitely not responsible for these third party links, which means that the possibility to infect the system is not so low. You should also know that StormVade might collect information related to your browsing habits in order to provide you with ads based on your interests. Plenty of undesirable applications come bundled nowadays. Actually, it is the easiest way to distribute them because many computer users do not pay enough attention to the installation wizard and just keep clicking Next all the time. Of course, some programs do not inform users about their presence and thus enters the system silently, which is why it is important to have an antimalware tool installed on the system. If you keep it enabled all the time, you will be able to avoid a great deal of infections that seek to enter. 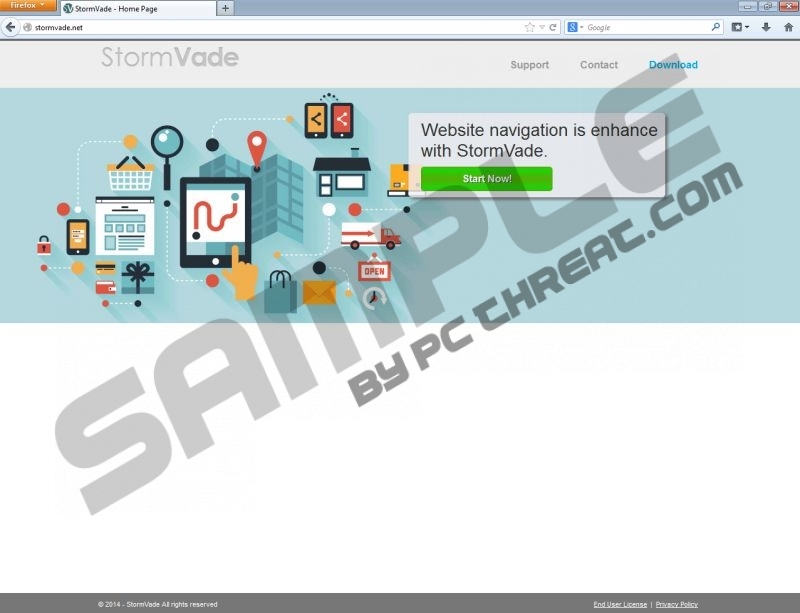 As other advertising-supported applications, StormVade Ads can be erased via Control Panel. However, if you have never done that, you can use the instructions that we have provided for you below. Antimalware tools would also detect this program as adware and remove it very quickly. However, it is your choice which method to choose. If you are determined to erase it manually, our only recommendation is to scan your system with a reliable scanner and find out if there are no other threats left. Right-click on StormVade and then select Uninstall. Quick & tested solution for StormVade Ads removal.